Last week the Federal Open Market Committee (FOMC) of the US central bank (Fed) has confirmed a more cautious approach towards monetary policy in 2019. New economic projections of FOMC members, which are released at a quarterly frequency, do not indicate any further changes in the federal funds rate in 2019. After four interest rate increases in 2018, the upper bound of the federal funds target rate stands at 2.5 %. With signs of the US economic expansion losing steam and the level of the federal funds rate within estimates of its longer-run neutral level, the Fed sees no need to further tighten monetary policy. At the same time, the FOMC adjusts the pace of balance sheet normalization. 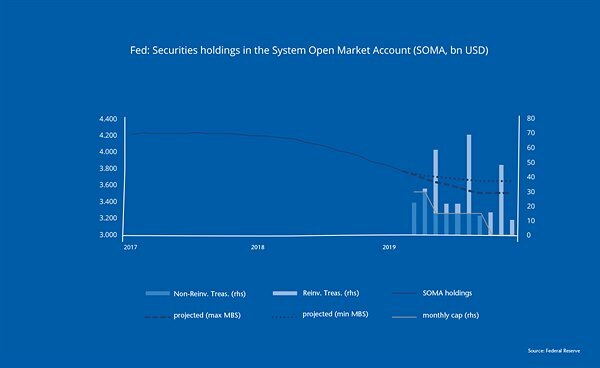 Monthly redemptions of Treasury securities which are held within the Fed’s System Open Market Account (SOMA) will be capped at 15 bn USD from May onwards, currently being capped at 30 bn USD. Moreover, principal payments will be fully reinvested from October 2019 onwards such that the size of the SOMA portfolio will remain close to 3,500 bn USD. Overall, both measures confirm the Fed’s shift to a more cautious data-dependent wait-and-see approach, which has already been heralded in January. In December, FOMC members still expected the federal funds rate to be increased two times in 2019. The most recent economic projections of FOMC members from last week indicate the federal funds rate to remain constant for the whole year. Why the change in course? Since last December, uncertainty regarding the strength of the US business cycle has intensified. The US economy has experienced strong growth in 2018, at 2.9 %, yet already available indicators for the first quarter of 2019 point towards weaker growth momentum. The Federal Reserve Bank of New York, for instance, predicts annualized quarter-on-quarter GDP growth (q/q, saar) at 1.3 % for Q1 2019 and 1.7 % for Q2 2019. Assuming this pace to endure for the whole year (average over Q1 and Q2), would yield an annual GDP growth rate of 2.1 % for 2019. This is about half the growth momentum of 2018. The FOMC members’ economic projections show GDP growth at 2.1 % for 2019, indicating their expectation of slowing growth momentum. Nevertheless, compared to the December projections, GDP growth in 2019 has only been adjusted moderately from 2.3 %. No significant downward adjustments of economic growth combined with a lower expected federal funds rate path is well in line with our last week’s UNIQA Capital Markets Weekly. Last week’s FOMC meeting has further brought an update on the Fed’s balance sheet normalization. Since October 2017, the Fed has continuously reduced its balance sheet by reducing reinvestment of principal payments it receives from securities held in the System Open Market Account (SOMA). Since then, the SOMA portfolio has declined by 468 bn USD to reach 3,756 bn USD as of March 20th, 2019. So far, monthly redemptions have been capped by 30 bn USD in the case of Treasury securities and 20 bn USD in the case of agency debt and mortgage-backed securities (MBS). In May 2019, however, the cap on monthly redemptions of Treasury securities will be reduced to 15 bn USD, slowing the pace of balance sheet normalization. Moreover, from October 2019 onwards, principal payments will again be fully reinvested, thus, holding the SOMA portfolio constant. Applying the monthly caps to the specific maturity profile of the SOMA portfolio yields a final portfolio of 3,506 bn USD by the end of September 2019 (Figure 1 - see pdf). Once the SOMA portfolio has reached its new constant level in October 2019, its composition will, nevertheless, change. That’s because the Fed intends to reinvest redemptions from agency debt and MBS into Treasury securities up to a monthly cap at 20 bn USD. At the moment, agency debt and MBS account for 1,602 bn USD, or 43 % of the SOMA portfolio. Hence, from October 2019 onwards the Fed will extend its holdings of Treasury securities by up to 20 bn USD per month. By the end of 2020, the share of Treasury securities within the SOMA portfolio might, therefore, increase to 67 % or 10 %-age points above today’s share. Thus, the Fed intends to reduce its balance sheet until September 2019 after which the SOMA portfolio might remain constant for some time. The SOMA portfolio’s level at which it will remain constant, roughly 3,500 bn USD, will nevertheless change its composition as the share of Treasury securities rises. It should further be emphasized that, in spite of, a constant SOMA portfolio, reserve balances will gradually decline. As non-depository liabilities on the Fed’s balance sheet are gradually increasing, mainly federal fund notes (currency), deposits need to go down, at constant asset holdings. Once, the level of reserves has been reached, which is consistent with efficient and effective implementation of monetary policy, the Federal Reserve will again increase its securities holding to keep pace with trend growth of non-reserve liabilities. The adequate level of reserve balances remains uncertain. In a recent speech Fed Chair Jerome Powell indicated estimates around 5.6 % of GDP to be the new normal with total liabilities at 16.5 % of GDP. In nominal terms the latter would roughly correspond to 3,500 bn USD for the total balance sheet, based on nominal GDP in 2019, thus, not too far apart from end-of-year estimates. It should not be too long before the Federal Reserve balance sheet has reached its new normal.